Last week Clear Channel Canada joined our 250 closest friends and colleagues to attend the Toronto Ad Club’s annual OOH Day Showdown – this year with a Rock and Roll theme! Sporting our best leather jackets and leopard prints our team arrived at the Arcadian Court ready to make our mark at the highly anticipated event. During the pre-lunch networking and cocktail hour (booze before noon? Oh yes, very rock-and-roll! ), Clear Channel was inescapable, proving that we know how to execute great Out-of-Home, having branded the bar with our signature blue and creating not one, but six signature drinks matched to our six main audience personalities with a musical twist. Phew! Scattered among the tables tops attendees could find our customized paper Fortune Tellers (sometimes known as Cootie Catchers). Designed to let players Meet Your Target Audience, each interior flap described a different audience and which of our venues they can be found in. Clear Channel was shortlisted in all but one of every category we were nominated in, including the biggest prize of all, the Grand Prix OOH Showdown category, which determines the best campaign of 2016 from all previous category winners. We went home with the award for the Non-Traditional category for our execution of Fallsview Casino’s “It’s A Wild Ride” campaign which featured a 28-foot, 3D roulette wheel with 11 roller coaster seats and 6 life-size mannequins suspended above Yonge-Dundas Square on the AOB Tower. 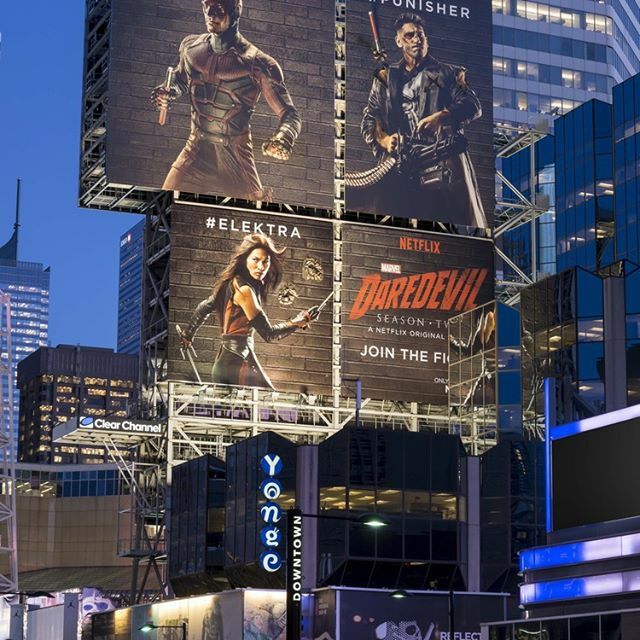 We also took home top honours for the Mobile Integration category for Netflix’s “Fighting Billboards” campaign which saw the North side of our AOB Tower turn into a hashtag-driven battleground. While winning does feel great, it was also really cool to see the other great campaigns that had been executed over the past year and to get inspired for what’s to come in the new year. Our hats go off to the entire Ad Club OOH Day Planning Committee (and a special shout out to the Event Chair, Clear Channel’s own Ari Zagury!) for a fabulous day of celebrating the best in class of our industry. We can’t wait till next year! Read more about our audience-centric drink menu below! Why? Rum and Coke is a classic student drink – easy to make and easy to drink. We’re sure Australian rock band Tame Impala has had a few in their day. Why? While they’re not Millennials themselves, The Red Hot Chili Peppers are a quintessential Millennial band and we thought the spice of a rye and ginger would be an appropriate match! Why? Inspired by on-again, off-again couple Jack and Meg White of The White Stripes, the white (ok clear) vodka and the red cranberry juice was a perfect combination to represent DINKs. Why? The Beatles are the biggest rock band in history – and they’ve made a couple bucks while doing it! We figured the Fab Four probably relaxed after a gig while sipping on British Beefeater Gin. Why? Electro-pop/rockers MGMT are named perfectly to reflect and we’ve seen enough episodes of Mad Men to know that Scotch on the rocks is the drink of choice by people in power! Why? The Kings of Leon are a band of literal brothers (and cousins) and, in keeping things family-friendly, we figured we’d subtract the booze from this bevvie option.